*Actual On Road Price of Benelli TRK 502 at the dealership may vary. 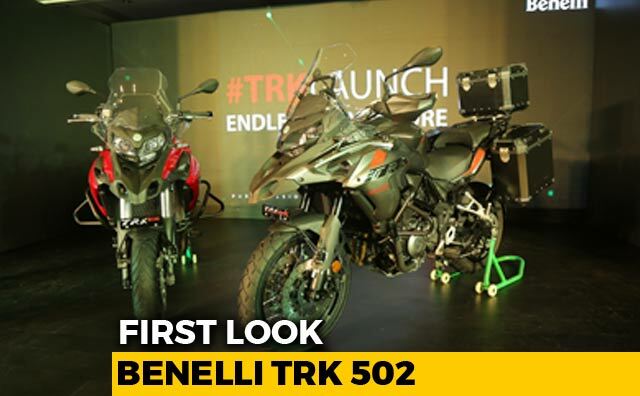 Making a comeback into the Indian market after a brief hiatus, Italian bike maker Benelli has kick-started its new innings with the TRK 502 and the TRK 502 X motorcycles. The adventure tourer motorcycles are in a new league altogether with no direct rival in terms of displacement. Nevertheless, the bikes are an interesting proposition in the market that is taking adventure bikes very seriously. The TRK 502 and the TRK 502 X are packaged as all-rounders that can tour and go off-tarmac as well, depending on the variant you choose. Prices for the TRK 502 start at Rs. 5 lakh (ex-showroom, Introductory), and bookings are open on the company's website. The Benelli TRK 502 is a good looking offering. The front end gets angular, Transformers-inspired headlamps with LED daytime running lamps and a typical ADV beak protruding out. The fat USD forks add to the muscular appearance, while the massive fuel tank with extensions takes prominence. The bike comes with a tall windscreen, split seats contoured for maximum comfort, and a massive grab rail with pannier mounts. The bike comes with a crash bar, while the side-mounted exhaust is upswept in a bid to offer more off-road capability on the 502 X. The bike gets an exposed Trellis frame, like most Italian motorcycles, and the bike can be had with either alloy wheels on the TRK 502 or spoked wheels on the TRK 502 X. The ground clearance on the 502 is 190 mm which increases to 220 mm on the 502 X, and the seat height is 800 mm on the 502, while on the 502 X, it is 40 mm more. Overall, the TRK looks beefy and brutish, and larger than its intended size. The Benelli TRK 502 doesn't have a long list of features like other, more expensive ADVs do but it packs in the essentials. The bike sports a part digital, part analogue instrument console that includes an analogue rev counter while the digital display shows speed, fuel, trip meters, odometer, and gear indicator along with engine temperature. Benelli also offers a USB charger as standard, which is placed on the left side of the fuel tank, right below the switchgear. The footpegs are serrated and the rubber can be removed if need be, offering better grip when riding off-road. As far as touring abilities go, the TRK 502 or the TRK 502 X has a fuel tank capacity of 20 litres, which allows for a range of 600-700 km in a day. Lastly, the 502 X gets handguards and a tiny metal bash plate as standard, while on the 502 you might have to get them installed as optional. The Benelli TRK 502 and the TRK 502 X are powered by the 499.6 cc parallel-twin, liquid-cooled engine tuned to produce 47 bhp at 8,500 rpm and maximum torque of 46 Nm at 6,000 rpm while being paired with a 6-speed gearbox. The Benelli TRK 502 and the 502 X get 50 mm upside down forks which are non-adjustable, while the rear is a monoshock unit that can be adjusted for pre-load and rebound. Braking performance comes from the regular 320 mm discs with fixed callipers while the 502 X gets petal discs which dissipate heat better and the floating callipers work better while off-roading. The bike is heavy with a kerb weight of 235 kg, which does make a lazy handler. The Benelli TRK 502 gets 17-inch alloy wheels wearing Pirelli Angel GT rubber, while the TRK 502 X rides on wire-spoke wheels with a 19-inch unit up front and a 17-inch unit at the rear with Metzeler Tourance dual-purpose tyres. The Benelli TRK 502 is not loaded on electronic aids but does get dual-channel ABS as standard that can be switched off completely. The price point and displacement put the TRK 502 in a league of its own. The Benelli is priced at Rs. 5 lakh, while the Benelli TRK 502 X will set you back by Rs. 5.4 lakh (ex-showroom). The prices include a decent amount of kit as standard on the motorcycle, which manages to please both touring and off-road enthusiasts in the entry-level adventure motorcycle segment. The competition is limited but growing for the Benelli TRK 502 and the TRK 502 X motorcycles. The bikes lock horns with the Kawasaki Versys X-300, Kawasaki Versys 650, BMW G 310 GS, Royal Enfield Himalayan and the SWM SuperDual T 650. Benelli's new middleweight adventure tourer, the TRK 502 has been having a tremendous response in India. Benelli India is also looking at increasing the dealership footprint across India.